Modern day comforts in an old world style. Easy walk to the Town Centre. 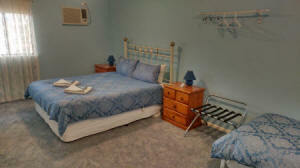 5 Rooms available - Singles, Doubles and Family. Located in the lovely old town of Beverley in Western Australia, just 135 kms from Perth, The Beverley Bed and Breakfast awaits to make your stay in the area a wonderful experience. The Beverley Bed and Breakfast offers clean, well appointed, comfortable, Motel Style rooms, separated from the House, with TV, Free NBN Wireless Internet, a Fridge, Microwave, Air Conditioners, disabled access* and HD TV in all Rooms, all set in a quiet location with old world charm much missed in today's hectic lifestyle. 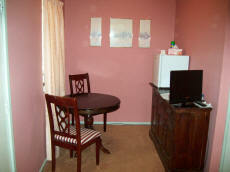 The Double rooms have their own Ensuite and the two Single rooms have a shared Ensuite and Kitchenette**. Outside in the Guest Garden is a BBQ area with outside chairs and table, perfect for the family in summer. 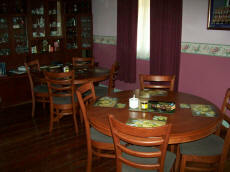 There are Tea and Coffee facilities in every Room and Breakfast is served in the separate Dinning Room. Off Street Parking is provided for cars and trailers and larger vehicles can be accommodated on the adjoining second car park or in the very wide street right in front of the B & B. Motorbikes can often be parked in one of our garages if available. Please check the Room Pages for features and conditions. Quoted room tariffs are for the basic room as extra beds are at extra cost. We value Seniors and offer them a Seniors Discount. Beverley has plenty to see with an Aeronautical Museum, Last Drop Historical Museum, many architectural styles including Art Deco buildings and is the home of the National Trust's Avondale Discovery Farm just 6 kms out of town. The Avon River runs next to the heart of the Town with a shady park right on the bank and there are Hotel restaurants and two Cafes a short walk of a kilometre from the B & B. Just 20 minutes (33 kms) up the road is the town of York which offers more attractions such as automotive museums, restaurants and wineries. There are plenty of activities going on in Beverley. At the Beverley Airfield there is Gliding and Flying. The WA Tractor Pull Association hold their meetings at the old Racecourse and the MotoCross Club has a large circuit less than 2 km out of town. Sometimes there are Bush Bash motor racers for hire. Beverley Bed & Breakfast is an ideal place to base yourself for Astronomical Observations as the light pollution is very low, even in the Town site. By travelling just outside Beverley there are many places where there is no ambient man-made light or obstructions to spoil observations. In to cycling? Beverley is a great destination to cycle to and Beverley Bed & Breakfast is a great overnight stop with lock up bicycle storage and a qualified bicycle mechanic available in town. There are several challenging hills in the area and low traffic roads make for safe cycling. Beverley was the start of an historic annual bike race to Perth, and there is a long distance bike race based on Beverley in October every year with long, medium and short courses. Check the Beverley Shire website for details. Ask us about the challenging but low traffic paved route to Beverley from The Lakes. A Credit Card is required to secure any room. Unsecured rooms will only be held for a maximum of 24 hours. Any Cancellations should be made by telephone as there is no guarantee an email will be received in time and may still incur a penalty. We take no responsibility for late cancellations. ** Please note that that the cooking facilities for Rooms 1,2 & 5 are limited to the outside BBQ and a microwave in each room. 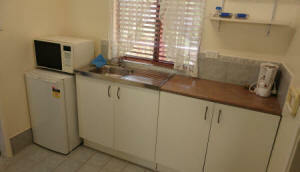 Rooms 3 & 4 have a small shared kitchenette with microwave, hot plate, cooking utensils and crockery. Many Travel Websites carry information about Beverley Bed & Breakfast, some of which may not be correct. We try to correct these websites where possible but most will not change their information even when asked to do so. Therefore we reserve the right to advise you of our current policies & tariff. All rooms are usually quoted as a one or two person occupancy depending on room type. Extra beds, where available, are quoted at an extra cost. We cannot allow extra client supplied beds or swags in any room. Please be aware that we cannot accept any animal in any room of the B & B. 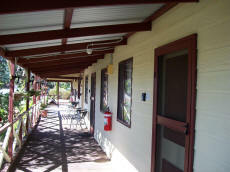 *Our disabled facilities are limited to ramp access only from the car park and flat verandas without stairs to each room.